We had a mango party last month where everyone who attended brought along a mango dish and mingled over mango kombucha and cardamom + mango coffee. 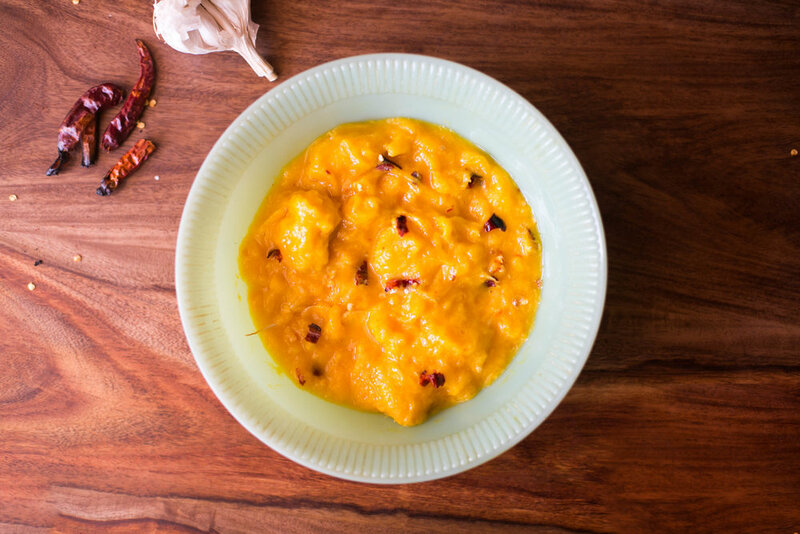 I made a sweet mango curry with those small mangoes called chakarakutta, (which is a darling name for a mango and translates to sugar babies) but earlier that evening, while I was making the dish, we ran out of cooking gas, and everything came to a screeching halt. And because sometimes life is like a Karan Johar movie, it also started raining with all the accompanying sound and light works. I grabbed my pot and ran over to my neighbour’s house where I finished up and I have never been more thankful for friendly neighbours my whole life. Moral of the story: smile at your neighbours, kids. While the sweet mango curry never fails to disappoint, the last couple of times I’ve set out to cook with mangoes, I’ve been making a version of it that doesn’t actually require any actual cooking – so even if you find yourself suddenly gas-less (hehe), as long as you have some mangoes, garlic, salt and dried red chillis, you have yourself the makings of a feast. But if you do have access to a stove, even better, because smoking the red chilli first adds an undeniable oomph to the dish. The recipe comes from my aunt Razia who makes the sort of inspired lunches that will make you use words like shabash! and zabardast! While this is really delicious eaten on the side with some boiled rice and curry, I won't be surprised if you skip the rice, eat a bowlful of this and call it a day. PS: This post is for my aunt Zeenath, who recently said, "give me one post a month, Aysha!" In a dry kadai, heat the dried red chillies over a medium heat until fragrant. This takes about 2-3 minutes. Take off the flame and let it cool. Put the mangoes in a big mixing bowl, and squish them up, leaving the seeds in. Add the garlic, the dried red chillies and salt. Give it a good mix till well incorporated, and the chillies are crushed. You could eat it right away, but it is best eaten chilled.